Pompey haven't sat at the top of a division since they were crowned League Two champions on the final day of the 2016-17 season. That was the only time the Blues were at the summit of the table that campaign, spanning just 32 minutes in total. This term could be very different, though, if Kenny Jackett's men deliver a win at Peterborough. Pompey sit second ahead of the trip to London Road. They're two points behind leaders Posh, but a success for the visitors would see them leapfrog Steve Evans’ side. Although Jackett may disagree, there are sections of the Fratton faithful who regard this as the Blues’ first real acid test of the campaign. Pompey have been pushed by the likes of Luton, Doncaster and Shrewsbury so far. But, in terms of league position and the bookmakers’ odds, it’s the first time Jackett's outfit will meet a bona fide promotion rival. Peterborough’s early form has underlined their title credentials this campaign. Despite bringing in 18 new players over the summer, they've gelled together swiftly. They possess superb attacking prowess, with the likes of Jason Cummings, Mark Godden and Siriki Dembele at their disposal. The fact players with the quality of Marcus Maddison and Ivan Toney have been on the bench speaks volumes about the class of Evans’ squad. Nevertheless, Pompey also boast potent attacking outlets like Ronan Curtis, Jamal Lowe and Oli Hawkins in their potential starting line-up, with Brett Pitmann once again expected to be on the bench alongside Joe Mason and David Wheeler. A win against Peterborough would not just move Jackett's troops top of League One but would truly highlight their intent this term. When Pompey found out they'd be without Ronan Curtis for game against Shrewsbury last weekend, there was a confidence they'd have the attacking qualities to cope without him. The Republic of Ireland under-21 international's influence has been key to the Blues' rise to second in the table. But on paper it appeared Kenny Jackett had the resources to replace Curtis on the left wing. Andre Green was the man who came in for Curtis. However, despite arriving with rave reviews, the Aston Villa loanee failed to make the desired impact on his debut. David Wheeler improved things when he replaced Green after half-time, injecting more pace and direct runs into Pompey's attack. But Jackett will be delighted to have Curtis again available for selection. The former Derry City man has tormented League One defences since making his debut against Luton, continuing to blossom in his new surroundings after every game. Just his presence will be a fillip for his team-mates who know he has got the ability to unlock the Posh's defence. In a top-of-the-table battle, it will be key Pompey’s most important players handle the pressure and deliver the goods. Given Curtis' confidence in his own ability, he’ll be ice cool at London Road and relishing the match. Christian Burgess doesn’t need reminding about his error against Shrewsbury last weekend. 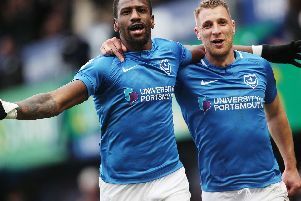 The centre-back's mistimed header gifted Greg Docherty the Shrews’ only shot on target at Fratton Park – and their goal. Burgess’ reaction following the mistake told all about how he felt. Head in his hands, he wanted the Fratton turf to swallow him up. However, bar that incident, Burgess was one of Pompey’s most impressive performers on a generally dismal afternoon. The 26-year-old knows it's crucial for him to bounce back against his former club – especially with Jack Whatmough soon returning from injury. Burgess is someone who’s a great believer in the mental side of things. Now he must practice what he preaches at London Road.